Álvaro Morales Vicente is from Spain. He received his Bachelor Degree in Telecommunication Technologies Engineering from the University of Valladolid (UVa), and his Master Degree in Telecommunication Engineering from UVa. During his Master programme, he completed his Master Thesis entitled “Software-Defined Optics and Software-Defined Networking” as an exchange student at the Department of Photonics Engineering at Technical University of Denmark (DTU). He possesses a background in photonics, electronics, radio communications and computer networks. His interest in optical and radio communications led him to join the group of Prof. Idelfonso Tafur Monroy at DTU in July 2016. 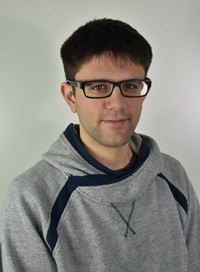 As part of the CELTA project, his PhD will be focused on beam steering for Terahertz signals by using hybrid photonics and electronic techniques. Beam steering is a crucial functionality required for several applications, such as wireless communications, sensing and imaging. A number of approaches based on the combination of technologies like multicarrier optical sources, multicore optical fiber and digital signal processing will be explored.